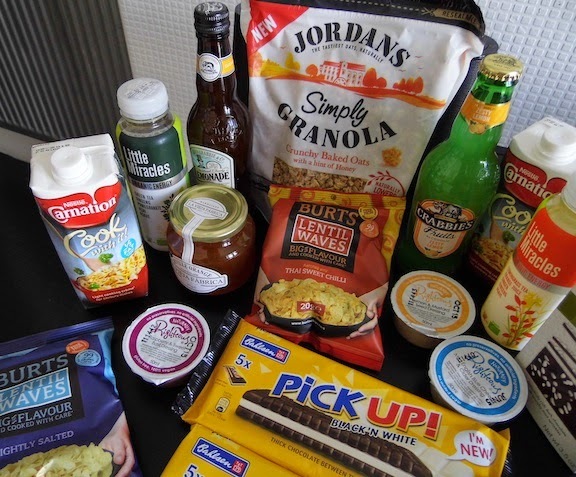 This month's Degustabox was an interesting mix of new foodstuffs as always. Degustabox - the monthly box scheme, always guarantees to provide value for money, with 9 to 14 surprise products every month. The value of the items received this month was just under £25. When you consider the box is only £12.99 to buy it is a great surprise for foodies. Carnation Cook With It - This product adds a creamy touch to savour dishes. A cooking cream it is made with fresh milk and has half the fat of single cream. Perfect to add that touch of luxury to Chicken Tikka Marsala, mushroom soup or Quiche Lorraine, I would definitely use it again. Pick Up Chocolate Biscuits - These biscuits are really, really chocolately and delicious. The chocolate ones reminded me of Oreo cookies, with a crispy chocolate biscuit but instead of a cream in the centre, white chocolate sandwiches them together. The normal biscuit ones are filled with milk chocolate. We loved them in this house! Little Miracles - These drinks are a blend of organic tea and fruit juice. At less than 90 calories each, this drink is a great pick me up with natural extracts of ginseng and acai. My husband thought they were great for energy and refreshment after jogging. Righteous Salad Dressings - These yummy sounding salad dressings include lemon and mustard seed, mild English blue cheese and cider, raspberry and sweet basil. What's great about these is that they have a good shelf life too. I can't wait to try them this week. Perfect when you want to pep up a few salad leaves. La Vieja Fabrica Seville Orange Marmalade - I am not a big fan of marmalade but this was well balanced with a hint of sharpness but not too bitter. Perfect on your toast in the morning I really enjoyed it. Jordans Simply Granola - Granola is one of my favourite cereals. This one is without any extra sultanas or raisins so is great for those that are a bit fussy with their cereal. I ate mine mixed with branflakes and soya milk. Also don't forget the goodness of oats in this cereal which makes it heart healthy. Burts Lentil Waves - These snacks were very tasty. They had a lovely cooked potato taste, like crisps without the fat. In sour cream, sweet Thai chili and lightly salted flavours, we really rated these as a family. A healthy alternative to normal crisps and packed full of flavour. Elizabeth Shaw Mint Thins - These thins made of dark chocolate and mint are great for grown ups and perfect after dinner with coffee or brandy. What I really liked about these were the subtle minty crunch on top. I can guarantee they won't last long in your house! Crabbies Non Alcoholic Lemonade - My husband drunk this before I managed to get to try it. After telling him to keep his hands of my Degustabox he said it was very lemony! Would he buy it again I asked him? Yes. Well there you go. 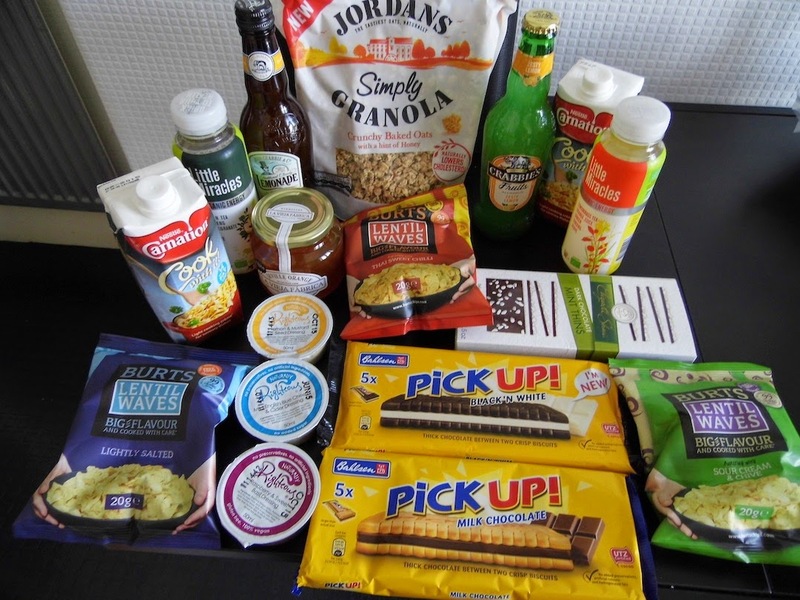 A great food box this month I must admit. Sometimes you do get the odd item you don't enjoy, but not this month. If you would like to subscribe a Degustabox subscription costs £12.99 per month, inclusive of delivery. The value of the items is usually a lot higher. If you would like a discount of £3 enter code 4784575 into checkout when registering. What a fun way to try out items you might otherwise miss. I might try this one out myself, especially as there is a £3 off code. I'm loving lentil crisps lately but haven't tried that brand out yet. Great post! Yes these lentil wave crisps were really yummy. If you try these boxes let me know how you get on. That's a shame Sarah. I did really enjoy this box this month. I think if you are open minded and like trying new things it is a great idea and makes a great gift too. I would love to see what you make Claire. Tweet me a photo. You can always give things you don't need to family or friends. I love the idea of this but I'd worry that food would go to waste if we didn't like some of the items. My mum used to get those hampers at Christmas that you paid for throughout the year and you can bet your bottom dollar that there would be stuff lurking in the pantry the following year from the previous year's hamper! The biscuits were some of the nicest I have ever had. I don't think I would use any of the food within this box, so not sure it would be worth it for me.